© 2008-2015 Muriël van der Ploeg - If you want to link to this blog or any post that is fine, wonderful, but please don't copy any text or any photo from this blog. Thank you! 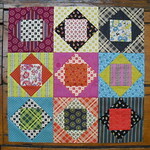 Remember I talked about the Double Dutch random sampler quiltalong. Today I am presenting the second block. Use 1/4" seams throughout. Sew two of the triangles to two opposite sides of the fabric 1 square. Press. Repeat with the other two triangles. Press. You should have a unit measuring 2-1/2" square now. Sew the long fabric pieces together along the 10" sides. Press open. Now cut this strip into 4 2-1/2" squares. Lay out the sewn units and fabric 3 squares in a 9 patch formation like on the photo above and sew them together to form the block. Press as you wish. Done! I have made two of these blocks for my sampler. I repeated the color in center to create some unity in the quilt. If you make the block and post a photo on Instagram please use #doubledutchqal so we can find it. You can tag me if you want, I'm @muriel14. 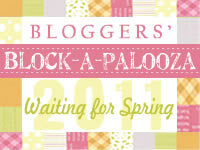 Also, you can become a member of our Flickr group for this quiltalong and post your photos there. Have fun with the Diamond Cross!